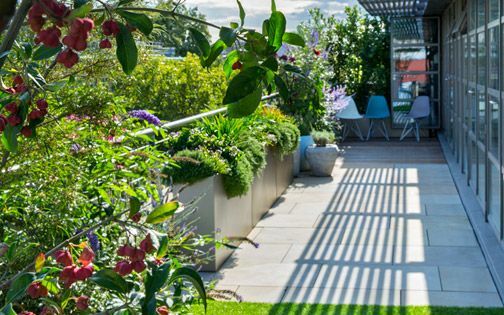 High up on Caro Point's 11th floor, the four rooftop gardens of this penthouse apartment feature expansive panoramic views over London. 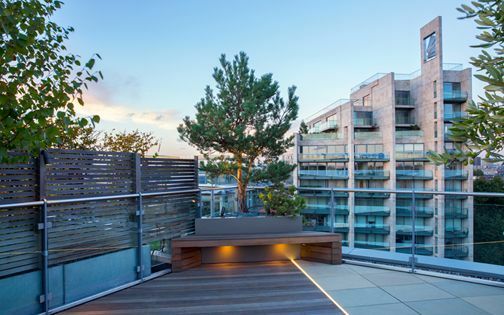 The outlines of Maple, Palm and Eucalyptus trees enhance a myriad of city landmarks in the terraces' backdrop, where granite and sandstone flooring intersect at angles to increase a pivotal sense of space. 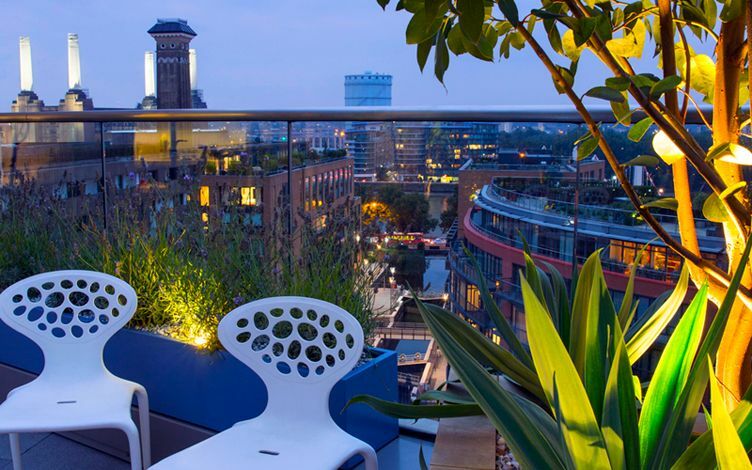 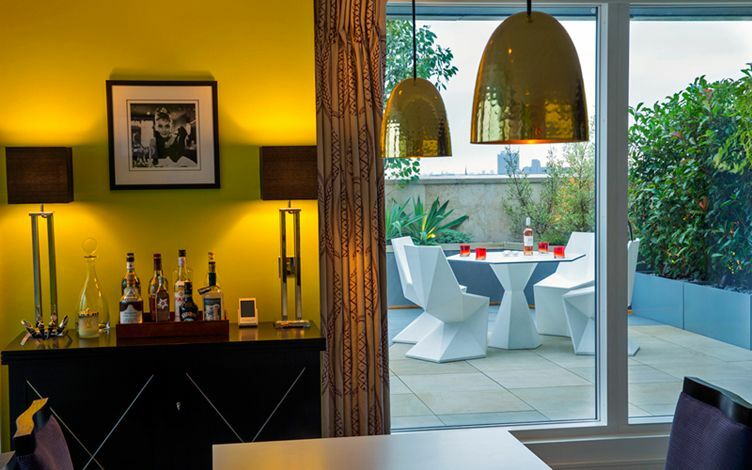 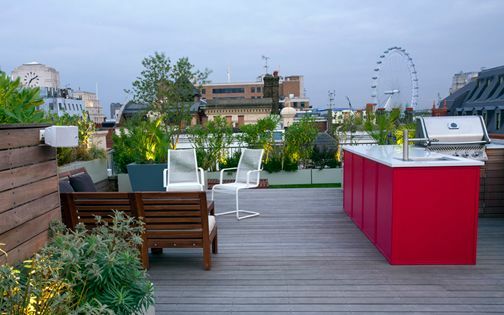 We designed the first roof terrace for our client in Hepworth Court, Grosvenor Waterside, who'd later on relocated to Caro Point opposite, into an 11th floor penthouse apartment encompassing four outdoor spaces. 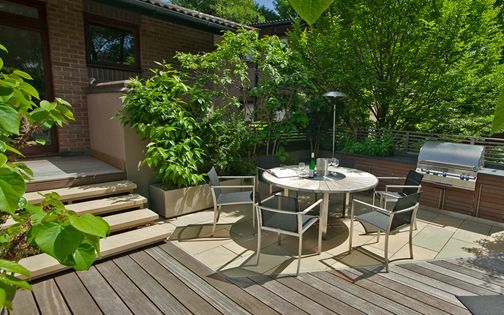 Gusty wind is constantly fluctuating across the main terrace, where an evergreen hedge creates a windbreak, as well as adding much-needed privacy from neighbouring residences. 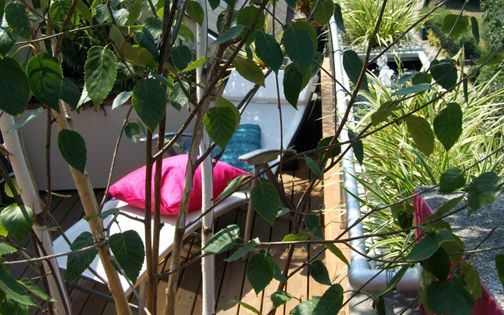 The following terrace, adjacent to the master bedroom, presents a further aspect, sheltered by an overhang and therefore shaded. 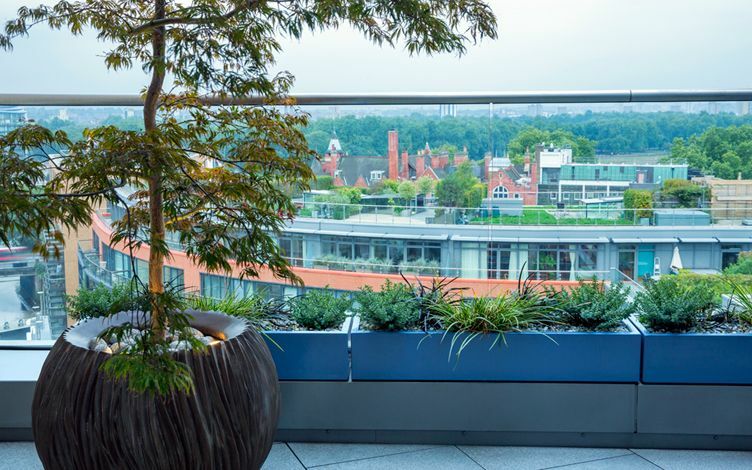 The third rooftop is situated near the study, providing a centrepiece to the entrance hall, while the ultimate space is nestled discreetly alongside the living room. 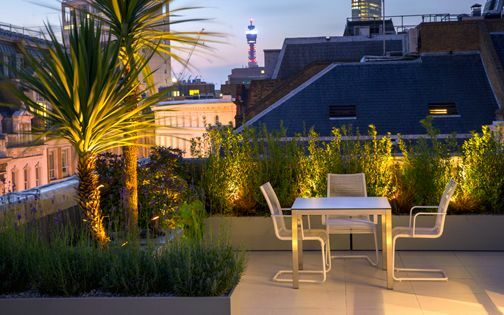 The minimalist essence and lush foliage form architectural gardens within a streamlined series of private Pimlico rooftops. 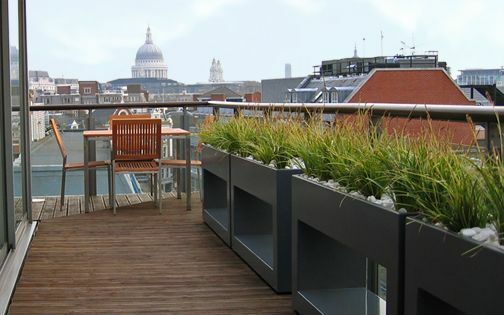 The building is named after the sculptor Sir Anthony Caro, and features warm limestone cladding in the development's fabric and throughout its modern rooftop terraces. 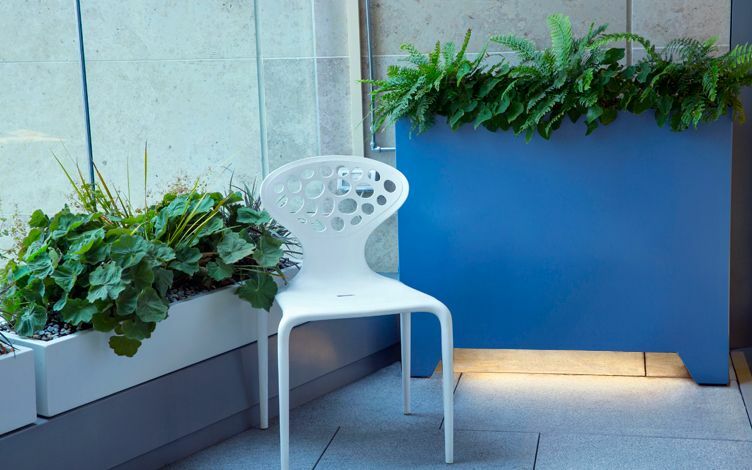 We echoed this textural element via sandstone flooring, contrasted with flamed granite, in a composition enveloped by cerulean blue, powder-coated planters. 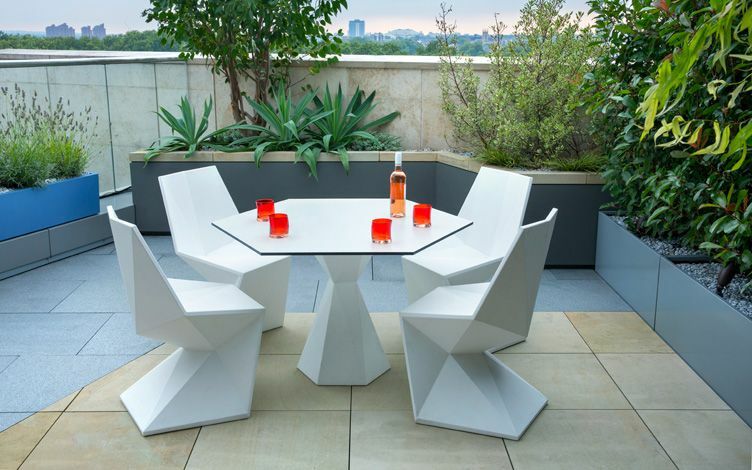 To expand depth within the small outdoor spaces, our design's angular lines distinguish two stone types, while leading towards distinct focal points. 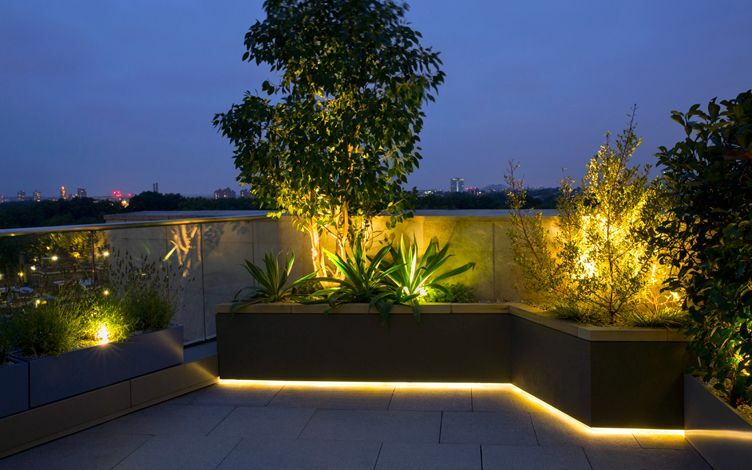 In the main roof garden terrace, a sculptural Eucalyptus tree is viewed along the kitchen's central axis, displayed in a floating raised bed which hovers above an LED light recess. 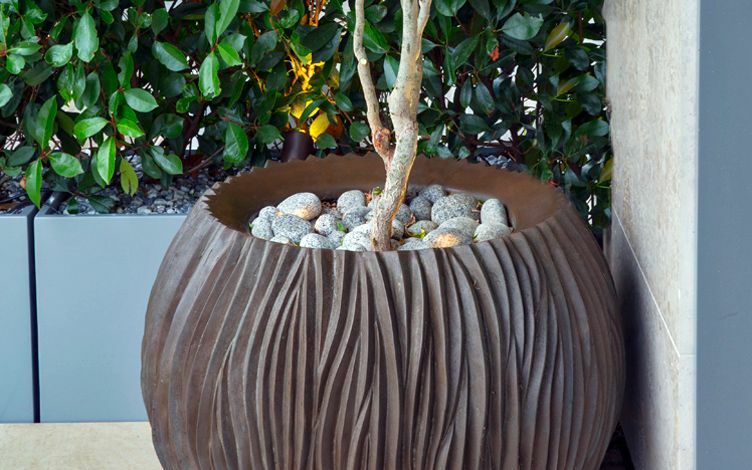 Adjacent to the master bedroom, a tall Japanese maple is featured in a coppery planter; its bronze foliage forms distinction amid grand limestone elevations. 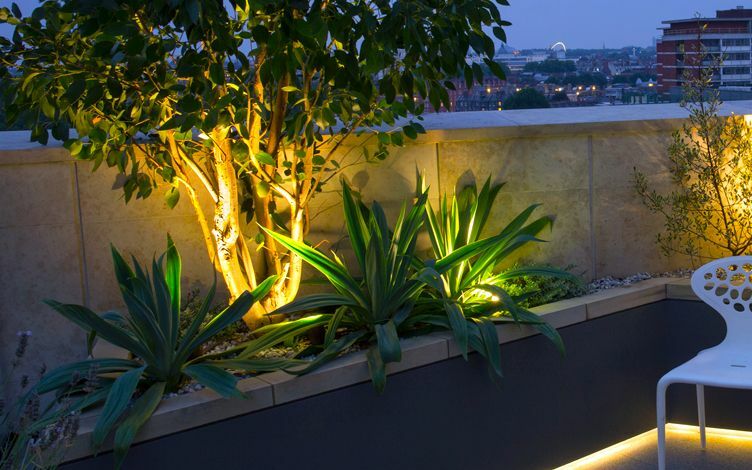 Sections of the rooftop gardens are inherently situated below deep overhanging eaves, where lack of a water source formed a significant landscaping element to solve. 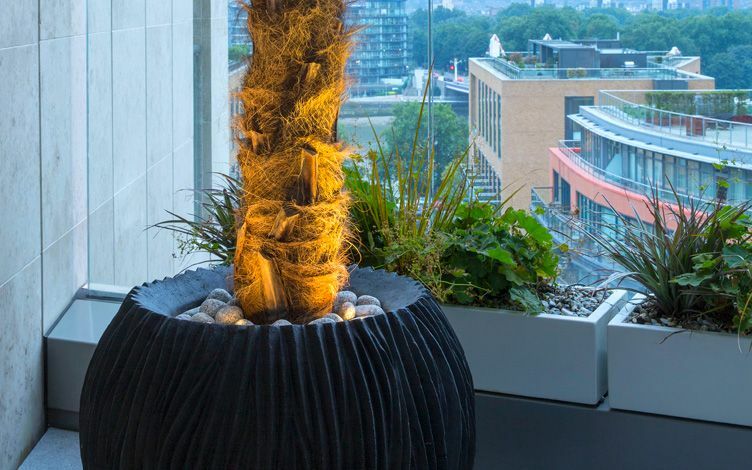 We produced an external tap for each rooftop garden, utilising imaginative plumbing techniques to provide vital irrigation which crucially sustains plant life. 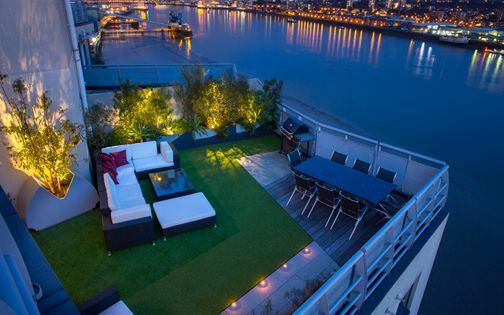 This thriving sky garden landscape is situated within expansive vistas into London's most iconic landmarks, where Battersea Power Station forms a prime focus, as well as Chelsea Bridge and Wembley Stadium. 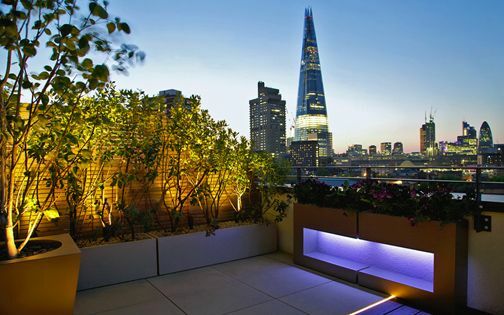 The urban scenery, experienced at such height, is enhanced by a minimalist terrace design & build and its subtle colour palettes – defined via detailed rooftop design ideas developed with an inspiring client. 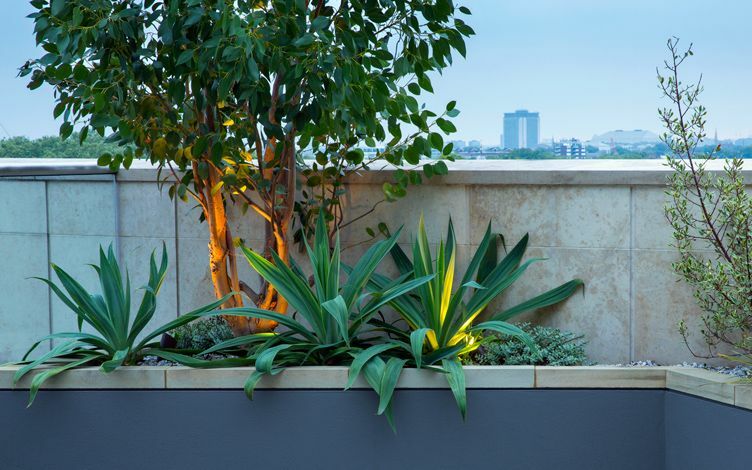 The sandstone surface outside the kitchen flows into the building's limestone cladding, where an angular design defines a dining area, highlighted by blue granite hues and azure planters which augment the skyline spectrum. 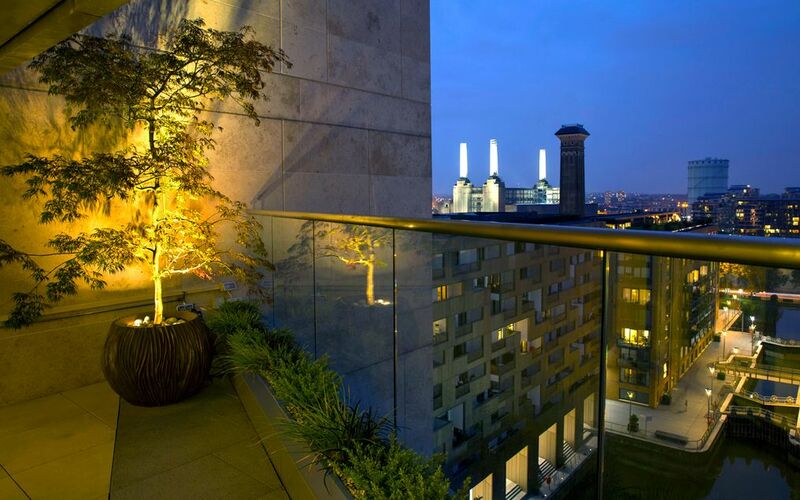 The multi-stemmed structure of a Eucalyptus tree sustains strong winds, forming a welcoming feature seen as far as Chelsea Embankment. 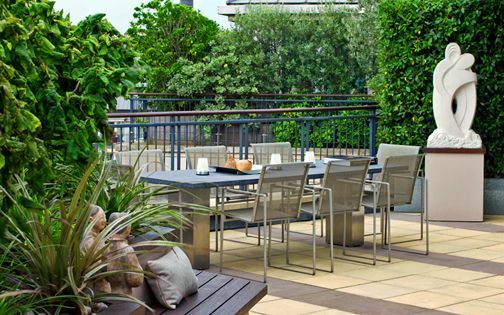 The warm tones of these interconnected London terrace gardens are congruent with the apartment's decor, while highly sympathetic to Caro Point's external fabric. 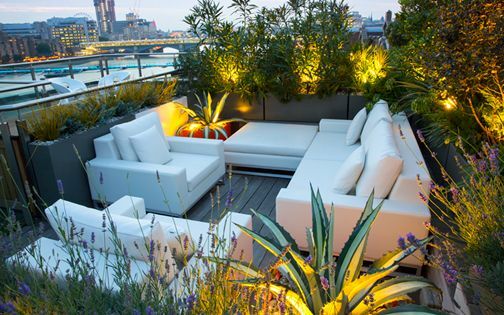 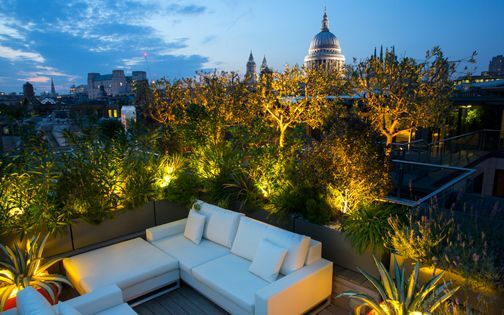 Towering above Grosvenor Waterside, this harmonious sequence of rooftop gardens and its unique sculptural forms is perched in tranquil quietude within Chelsea and Pimlico's renewed cityscape.